These adorable boys were, (and still are); the pride & joy of a local dentist & his wife. (That was more than 5 years ago…they are both teenagers now!). 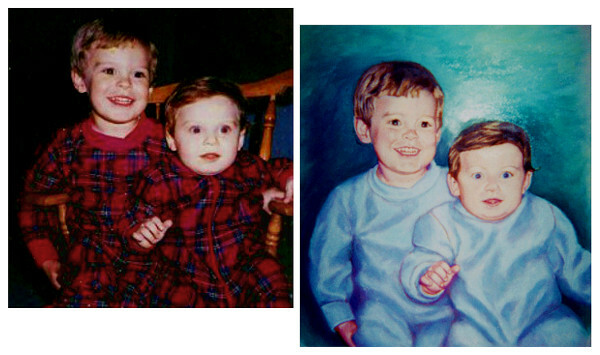 In the original photo, the boys wore matching tartan plaid pajamas; however to give the oil painting a more ‘ethereal’ quality. As an artist, I felt that their faces needed to be be the most important element; so I changed it to ‘white’. (As you can see in the photo… this white is really made up of several colors; that seem to make the actual color appear to be light blue.) Their clothing is intentionally done in a more impressionistic and less-busy style to have the focus on the boys’ faces instead of the plaid that was in the photo. Oil Painting : So You Want To Be An Artist?